Next is blush. Blush, to me, is the secret to looking alive. Sure, you could load on spackle under your eyes to cover your dark spots, but I think the best trick is to use a small amount of concealer, and then add blush. My favorite is Milk Makeup cream blush in Perk (which is inexplicably called simply “Lip + Cheek”), probably because it’s so easy to apply and kind of idiot proof. Just dab some on your cheeks, pat it in with your fingers, and DONE. All that’s left is eyes, and at this point I’m about two or three minutes into the routine. When I promise a 5 minute face I DELIVER. I fill in my brows (lately it’s been with Cover Girl Easy Breezy Brow Pencil in Soft Blonde, which I just reviewed last week) and then curl my lashes and apply mascara. I’ve rediscovered Maybelline Full n’ Soft mascara, which I’m loving right now. Just like the tube says, it provides a full look to your lashes without being clumpy or overly thick. This stuff is perfect for someone like me who is going for a minimal look but wants my lashes to be anything but minimal. 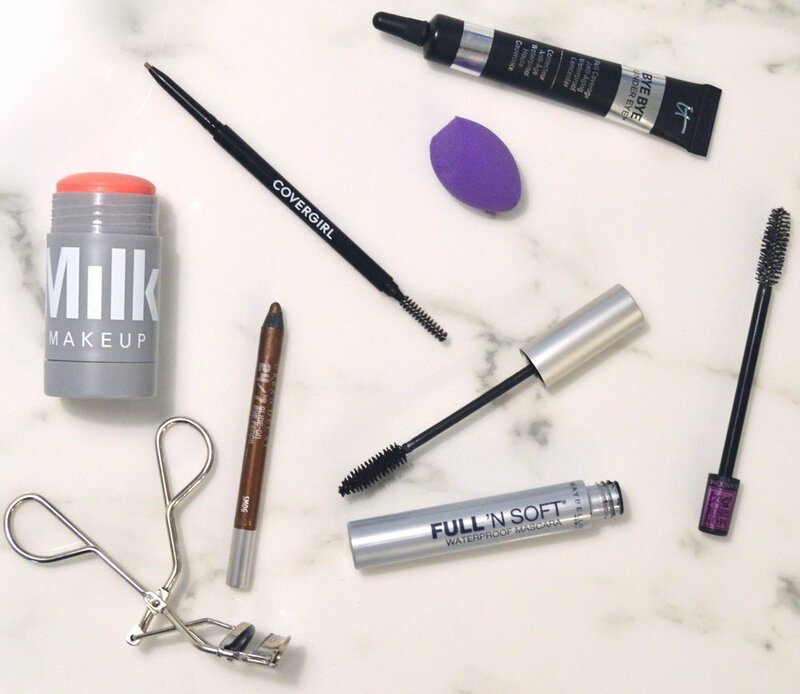 Full n’ Soft is like getting temporary lash extensions for $5 and doesn’t that sound IDEAL? I didn’t include lips in this, because that changes all the time. It’s often a subtle tinted gloss or balm, like NYX Butter Gloss in Strawberry Parfait or Clinique Pink Honey. Or just some Jack Black Lip Balm. Whatever’s within reach, really. And that’s it! This whole routine takes a literal 5 minutes and makes me feel just polished enough that I don’t imagine the world sees me as a troll who never leaves the comfort of my home. You know, on those rare days when I work on my laptop from a coffee shop instead of my couch.